For courses with large enrollment numbers, Elliott Hall of Music is Purdue’s most practical space for hundreds—and sometimes thousands—of students to take a single exam at once. While great for concerts and commencement ceremonies, the venue provides some challenges as a testing environment. Its dim lighting and a cacophony of sniffling noses can be distracting to students who have only tested in high school classrooms. That’s why, for the second year in a row, Purdue’s Academic Success Center (ASC) provided students with an opportunity to “Test Drive” the Elliott Hall exam experience. The event gives students—new freshmen in particular—an opportunity to take a timed, multiple choice practice exam in Elliott so they could experience the testing circumstances without any effect on their grade. Emily Kreighbaum, a freshman in the College of Health and Human Sciences, said the mock exam helped her set a better pace for taking her real Chemistry 115 exam days later. ASC Assistant Director Brandon Keith directs students on where to sit for their mock chemistry 115 exam in Elliott Hall of Music. More than 720 students participated in the Sept. 10 mock exam event, nearly double last year’s participation. While last year’s event focused exclusively on math courses, this year students from high-enrollment chemistry and biology courses also had an opportunity to participate. 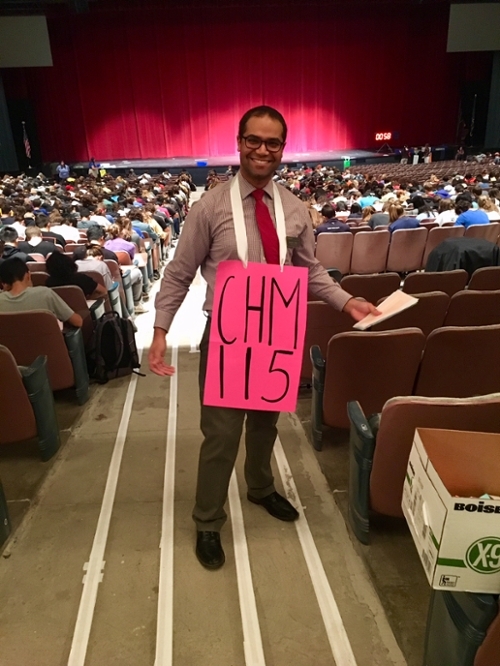 Chemistry 115 was by far the largest, with 458 student participants. “Many of our students were getting ready to take their first college exam, so just having the experience of lining up with all those people, knowing where the lap boards are, experiencing the lighting and seating may have resulted in less nervousness and pre-test anxiety for the real thing,” says Marybeth Miller, general chemistry coordinator. Miller says she initially had reservations about promoting the Test Drive event to chemistry students because real Chemistry 115 exams have assigned seating and the practice event, with seven courses participating, did not. Also new this year was the ability for students registered with Purdue’s Disability Resource Center (DRC) to take the mock exam in a distraction-reduced environment. “Sometimes not knowing what to expect can trigger or exasperate anxiety,” says Kelsey Jordan, DRC Testing Center coordinator. “By going through the Test Drive, our students now know what to expect for that first exam, which will hopefully help alleviate some of their anxiety for the real thing. In addition to experiencing the testing environment in Elliott, students also received graded feedback on their practice exam. As one of several proctors during event, Dufault said some students experienced issues that might have negatively affected their results had they been taking a genuine exam. Another hope of the mock exam is that it will provide students a better measure of their proficiency with the subject matter. Dufault says the ASC will continue to offer Test Drive annually, at the beginning of the fall term, with plans to adapt the event as new testing environments emerge. Meanwhile, preparing students for large-scale exams will continue to be a priority for the ASC. In fact, the ASC has already scheduled a variety of workshops that will help students prepare for final exams, improve time management, polish their study skills, and avoid procrastination. A full list of workshop opportunities is available on the ASC website; staff and faculty are encouraged to promote these free offerings to students who may be interested. Although advance registration is preferred, students may also register at the event.